Lewis Vaughan's fourth goal of the season secured an unlikely 1-0 win for Dumbarton at home to Morton in the Scottish Championship. 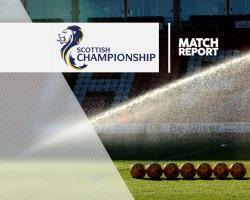 The visitors slipped down to third in the table after Falkirk beat Raith, after making it three matches without a win thanks to Vaughan's second-half strike. Lawrence Shankland, who was denied early on by goalkeeper Alan Martin, was the first to be denied by the bar after a rasping shot from inside the area. Andy Murdoch was next to be denied, exchanging passes with Jamie Lindsay before cracking the post, before Vaughan was fed by Ross McCrorie and finished smartly. Scott Tiffoney was the third player to be denied by the woodwork as a frustrated Morton fell to a narrow defeat.